Today's marketplace is an ever-evolving and sophisticated environment. This means organisations need to be able to adapt not only what they do, but the way they do it. ITIL 4 bridges the gap between the challenges of the current landscape and those of the future. Through its framework, ITIL 4 offers a practical and flexible solution for supporting organisations as they navigate the world of digital information. ITIL Foundation remains the entry-level certification, and covers a general awareness of the fundamental principles and terminology used in ITIL 4. All candidates will start with ITIL Foundation for both the ITIL Professional and ITIL Strategic Leader. Upon completing all five modules of both ITIL Professional and Strategic Leader, you will be eligible for assessment to become an ITIL Master. ITIL Practitioner is discontinued in ITIL 4. Instead of being a separate module, the Practitioner guidance is now a fundamental part of all modules in ITIL 4. ITIL Managing Professional (ITIL MP) is aimed at digital practitioners in the technology field, and provides practical advice on how to successfully manage IT projects and teams. ITIL Strategic Leader (ITIL SL) recognises the value of ITIL in digitally-enabled services, and reflects your understanding of the role IT plays in wider business strategy. The ITIL Managing Professional Transition Module has been created to recognise those who have achieved their ITIL V3 certification. It enables you to transition from ITIL V3 to ITIL 4. The Transition Module covers the key elements from the ITIL Managing Professional scheme. If you have at least 17 credits from V3, you can take this module without having to pass the Managing Across the Lifecycle (MALC) exam. The difference between an ITIL Managing Professional (ITIL MP) and an ITIL Strategic Leader (ITIL SL) is that ITIL MP includes the three Specialist modules, and ITIL SL includes the ITIL Leader module. Both contain the ITIL Strategist module. To become an ITIL Master, you must have both the ITIL MP and ITIL SL designations, which means completing the Strategist, Specialist and Leader modules. Previously with ITIL, you could advance to the Expert and Master levels by taking credits from just one Intermediate path, from the Service Lifecycle or Service Capability modules. 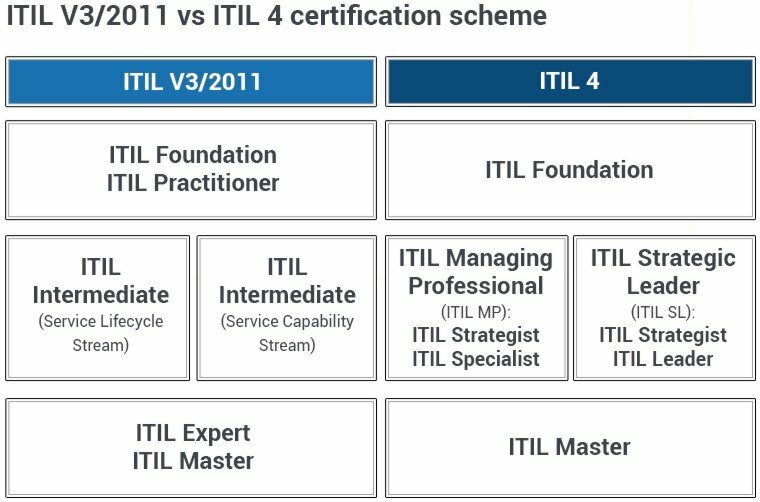 ITIL 4 now requires you to complete all modules to become an ITIL Master.